Turning pro to little or no fanfare back in May of 1973, no-nonsense southpaw Marvin Hagler (the ‘Marvelous’ was added much, much later; and legally) slogged his way up the hard way. Fighting tough guys for low pay checks, Hagler’s inner hardness was formed. Nothing came easy to him, and there were very few opponents that could in any way be referred to as anything other than formidable. Working his way towards a shot at the world middleweight title, Hagler met such worthy and capable opposition as: Sugar Ray Seales (W U10, D 10 and Won TKO 1), Willie “The Worm” Monroe (L UD 10, W TKO 12 and W TKO 2), Eugene “Cyclone” Hart (W RTD 8), Mike Colbert (W KO 12) and “Bad” Bennie Briscoe (W UD 10). Hagler also fought Bobby “Boogaloo” Watts, losing a majority verdict over ten rounds in Philly – this loss, from 42 years ago today, being Hagler’s first defeat. These two would meet again soon after Hagler’s first shot at the world title. In this fight, too, Hagler would lose controversially. Challenging world champion Vito Antuofermo on the under-card of the Ray Leonard-Wilfred Benitez welterweight title fight (for much less money than Sugar earned in his first world title fight), Hagler went home empty-handed thanks to a bitterly disputed draw. 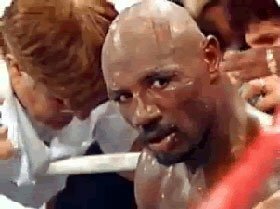 It was after this fight, held in November of 1979, that Hagler decided boxing judges could “never be trusted again.” From then on vowing to let his fists and his fists alone decide the result of one of his fights, Hagler was intent on destroying everyone in his path. After avenging his loss to Watts via an impressive 2nd round TKO five months after the Antuofermo disappointment, and after also picking up wins over Loucif Amani (W KO 2) and Marcos Geraldo (in what turned out to be Hagler’s last points win in over three years), Marv Met Britain’s Alan Minter in the new champ’s home country. Minter had won the title from Antuerfermo and now Hagler made his second attempt at capturing the crown. He suffered no setback this time. Crushing the man who had reportedly made the foolish comment beforehand that he’d “never lose my title to a black guy,” Hagler won in less than three rounds. Minter’s face was a disgrace due to bad cuts, but the behaviour of his fans was even more so. Pelting the new champ with beer bottles, Hagler had to be escorted from the ring. His coronation somewhat spoilt, Hagler was intent on keeping his belt for as long as he possibly could. Memorable defences came against fellow all-time greats Roberto Duran (W UD 15) and Thomas Hearns (W KO 3), along with retentions against good fighters like Antuerfermo in a return (W TKO 5), William “Caveman” Lee (W TKO 1), Juan Roldan (W TKO 10) and John “The Beast” Mugabi (W KO 11). As he made defence after defence Hagler cemented his reputation as one of the finest middleweights of all-time. But it was those rough, tough, no compromise early years and fights that carved Hagler into the simply marvellous ring warrior he would be celebrated as the world over.